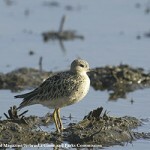 Description: Short thick bill, yellow with a black tip during breeding season, and dark in winter adults and juveniles. Breeding female is brighter in color than the male. Bright rust red underparts and neck; mottled buffy back; black crown; and white patch around eye. Male is a duller version of female; lacks black crown; and has a buffy patch around eye. Winter adults are blue-gray above without white stripes and white below; prominent dark eyeline. Juvenile is mottled buffy above and buffy below; white face and dark eyeline. 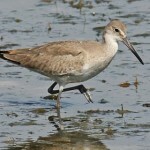 Habitat: Breeds in the tundra and spends most of its life on the high seas. 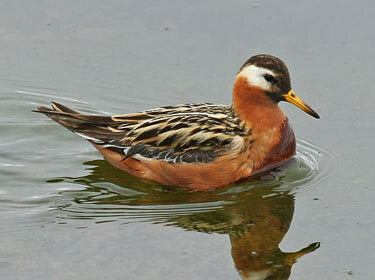 Where in Nebraska: Rare spring and fall migrant. Most records are from fall of juvenile and first-basic plumaged birds. Single specimen collected in Cherry County. 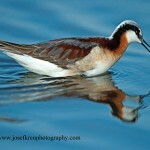 Fun Facts: Red Phalaropes when feeding will swim in fast, small circles creating a whirlpool to bring insects from the bottom up to the top.